Finding breakfast options for my diabetic husband that fit into an on the go schedule can be quite a challenge. It needs to be hearty enough to match up to his insulin injections, as well as, pack a nutritional punch. Over the years we tried to buy the sugar free or low sugar instant oatmeal packets, to put into his breakfast choices. The problem is that they just don't stand up all morning long, and the ingredients aren't all that exciting. So, I developed my own recipe. I use whole oats, ground flax seed for added fiber (which helps stabilize blood sugar), ground cinnamon (which also helps lower blood sugars), along with some chopped nuts (which can help lower heart disease ), and dried fruit adds vitamins, fiber, and flavor options without substantially raising blood sugars. I make them into ziplock bags that are individually portioned so he can grab one and make it on those busy mornings where time is short. My husband reports that the mornings that he eats a bowl of this Oatmeal mix, his blood sugars stay up almost all the way to lunch before he needs a healthy snack to tide him over! That's great news! It means his sugar levels are not too high or low and we really feel that for him this Oatmeal mix has made a huge difference in his glucose numbers! I love that you can be flexible and add or subtract ingredients to your own preference. I'll share my basic recipe with you, but feel free to play around with it. Mix all ingredients into a ziplock sandwich bag. Store in cool, dry place till ready to cook. 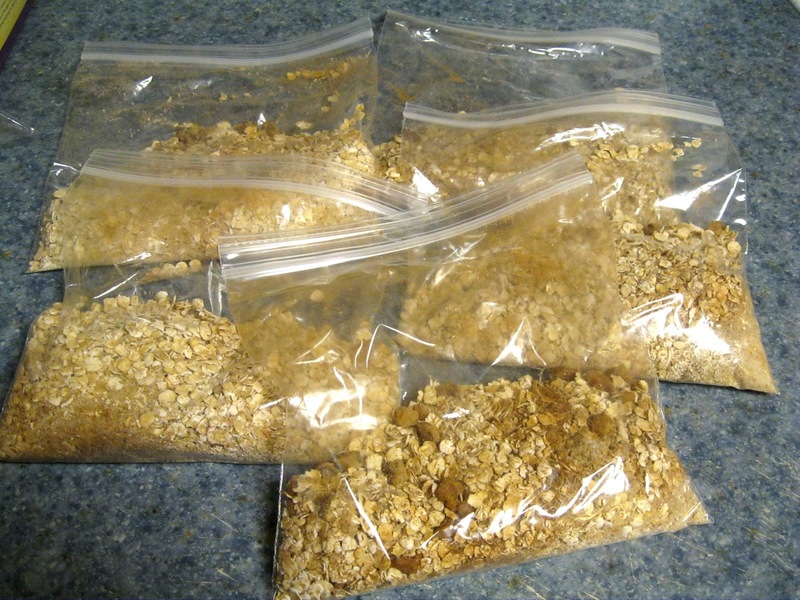 Microwave Cooking: In microwave safe bowl combine contents of oatmeal packet with 1 cup water. Microwave on high 1 1/2 to 2 minutes. Remove from oven. Mix well before serving. (microwaves vary so times are approximate). Stove top Cooking: Bring 1 cup water to a rolling boil. Add in oatmeal packet and stir. Reduce to medium heat and cook 1 minute stirring occasionally. Cover and remove from heat. Let stand 2-3 minutes before serving.